February 06, 2014 / Comments Off on EVERYONE’S GONE POWER CRAZY! As in their demand for POWER BANKS, which judging from their short supply, are rapidly becoming the most popular new promotional item currently on the market. For those of you now “in the know,” you already know what I speak. Power banks are the little square or rectangular devices which allow you to charge your mobile device any time or anywhere. 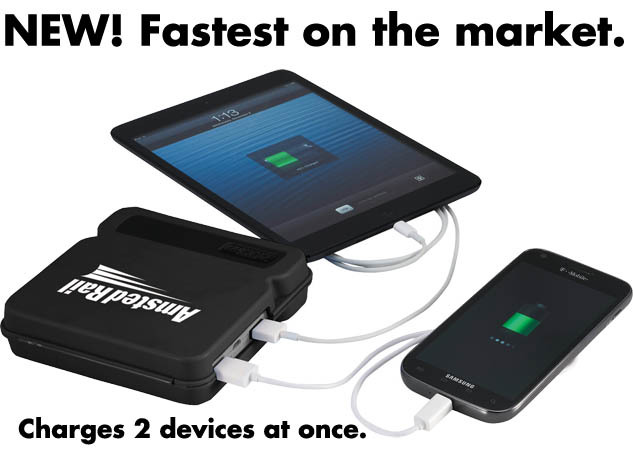 If your tablet or phone has ever run out of juice on a plane, on a train, at lunch, or anywhere for that matter, you know what a terrifying prospect this can be. especially if you don’t have time to sit at a wall awaiting a healthy charge. Or the dreaded walk through a huge airport trying to find an available outlet? These little gadgets represent the latest/greatest way to promote your brand. They range in price from under $5 to over $100. In the end, realize that you absolutely get what you pay for where these are concerned. While you don’t need to spend over $100 to get a good one, I wouldn’t recommend buying based on absolute lowest price. 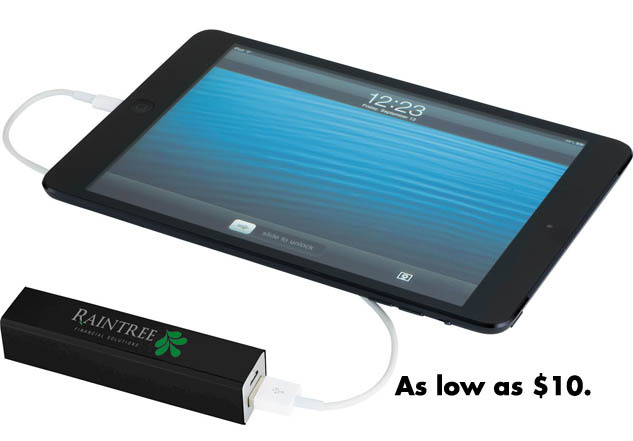 Don’t even bother for one that offers less than 2,200 mAh of internal battery with 5V/1A USB output. This is about the same charging power as most wall chargers and you can find one of these for right around $10 depending on the quantity and customization; something like the one pictured on the top right. On the upper end of the spectrum, make sure you consider the NEW Zoom Energy Pack (pictured bottom right). This beauty features an 11,200 mAh internal battery with dual USB outputs that charge multiple devices at the same time at a rate of 1A and 2.4A making it THE FASTEST IN THE MARKET. This one costs between $70 and $120 depending on the quantity and level of customization. It should go without saying that these devices do not come with the ipad or iphone; but I’m saying it anyway. Like everything, these can be purchased through our site www.PromoShopNow.com or by calling or e-mailing me directly at matt@promoshopnow.com.